Hiring? Toptal handpicks top financial analysts to suit your needs. Why are there many different measures and best practices for Return on Investment? Return on investment is not a necessarily a measurement to be viewed in isolation. Its primary goal is to provide insight into the entire operational performance of an investment or business venture. Different investors choose different measures to evaluate operational performance. Sometimes the choice is investor preference, and for others, it's driven by standard operating procedures within an industry. Return types are split into two categories: those from a going concern and those from an investment. Going concern returns monitor entire businesses that are expected to exist into perpetuity. Return on Assets (ROA) measures the effectiveness of using assets employed in a business to generate profit. It's a useful measure because returns in isolation do not show relative performance, while ROA can be compared against industry peers and other financial assets for comparative performance. Return on Equity (ROE) measures return relative to the equity investment made in the business. Its difference to ROA is affected by leverage used within the business and is used more to monitor financial return, over operating and financial efficiency. Return on Invested Capital (ROIC) expands ROE to show returns on all invested capital, debt, and equity. It is most useful for comparing returns with the weighted average cost of capital (WACC) of the business to assess whether appropriate hurdle rates are being met. Total investment returns are measured for stand-alone, one-off projects. Net Present Value (NPV) is an absolute measure that appraises projects with cash flows projected over its life. By discounting the cash flows by the investor's WACC it can be ascertained as to whether the project is value accretive. This measure is most useful for ventures such as real estate and project finance where regular cash flows are received. Internal Rate of Return (IRR) is a relative measure that takes undiscounted cash flows for a project and computes the breakeven WACC rate for the project to be profitable. Social Return on Investment (SROI) is a contemporary measure that looks to asses not only the profitability of a project but also the social benefit that it derives, measured across four categories of tangible and intangible social impact assessment. What return measure is right for me? At a minimum, all return calculations should be made, as they are useful and insightful to different types of investors in a venture. Equity investors' main focus is typically IRR and ROE. The former to monitor returns from the initial investment and the latter, because a going concern return such as ROE will provide strong indications towards an exit route for the business, for example via IPO. For debt investors, financial stability is key, making the Going Concern Measures an important metric for them to monitor, to ensure that the performance of the business is maintaining itself and/or improving. ROA and ROIC, in particular, shed light on how a venture will be profitable. Returns are measures not only of a venture's performance, but also a measure of one firm to another. This, benchmarking amongst peers is a critical activity for holistic performance measurement. Upon completion of a financial projection for a new project, the first question asked is often, “What’s my return?” The anticipated reply is a simple percentage or an empirical value representing projected profits. However, more often than not the actual response will be “It depends”. It depends on what one wants to measure. Return on investment is not a necessarily a measurement itself, on the contrary, it is more a category of measurement tools designed to provide insight into the operational results of an investment or business venture. Different investors choose different measures by which they evaluate operational performance. Sometimes the choice is investor preference, and for others, it’s driven by standard operating procedures within an industry. Ultimately, whatever measure is used, it is imperative that investors understand what the measurement is evaluating. It is also important to be sure the same measurement is being used to evaluate multiple investments: differing tools can result in apples to oranges comparisons. Returns can be going concern measurements calculated monthly, quarterly, or even annually. Other measures look to provide a return for an entire project or venture. The twenty-first century has ushered in an era of increased focus on areas such as sustainability, limited environmental impact, and social responsibility. The finance world has responded by embracing the idea of measuring the social benefit to be derived for various business ventures and investments. Accordingly, tools are being developed which attempt to measure the social return on investment. Using a projection for a company we will call ABC, Incorporated (see below) return measurements will be described in terms of their calculation procedures and the insight they provide into investor returns. Contextually this is actually a real example from a past client of mine, with the same and some figures modified. Return types are split into two categories, those from a going concern and those from an investment. The former reflects holistic returns from a business in its entirety, that is assumed to be a venture that will remain operating for the considerable future. Going concern returns thus provide an all-around snapshot of the performance of a business as a whole. Return on Assets (ROA) is a measurement of the effectiveness of assets employed in a venture to produce a return. ROA is a valuable measure as it describes the profit per dollar of assets employed. 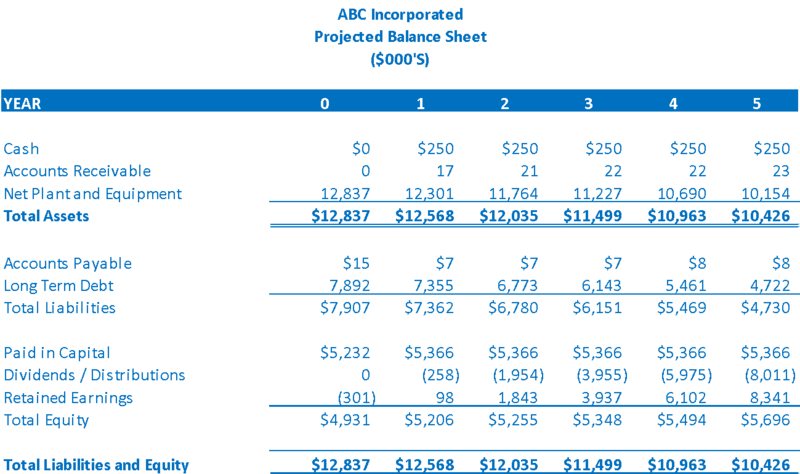 For example, in year 3 ABC is projected to generate $18.21 for each $100 of assets employed in the business. However, as is the case with most all return calculations, the empirical value is not the entire story. To illustrate, we will ask the question “Is 18.21% a good return on assets?” Unfortunately once again, the answer is “It depends”! In evaluating ROA, the first key is to understand the industry and performance relative to it. Suppose in ABC’s industry, the average return on assets is 20.00%. Clearly, ABC is performing below the average in the early years. However, note the trend in ABC’s ROA, it is improving, and by year 5 should be slightly better than the industry. For ROA to provide its fullest value, it must be viewed over time as a going concern measurement. While the point in time ROA is valuable, the trend analysis is of greater value overall. It is usually an error to evaluate empirical profits (dollar amounts) as a measure of return on investment. For example, British Petroleum’s net income for FYE 2017 was approximately $3.4 Billion. An enormous sum of money to be sure. However, BP’s ROA for FYE 2017 is 1.23%. This is significantly less than some of its competitors. By comparison, 10-year US Treasuries were yielding an average of 2.33% during 2017. Thus, if BP could have liquidated its ~$277 billion in assets and invested it in US Treasuries it would have had a greater return on assets with a far lower risk level. Accordingly, viewing empirical dollars alone is never a good measure of return. Every industry has similar operating processes between companies in the industry. Industrial companies, for example, have greater investment in assets. Oil companies have enormous equipment requirements. However, service-based businesses have far fewer assets. Compare Exxon with Facebook. While Net Income is comparable, Facebook’s ROA is significantly higher than Exxon. At first glance, one might assume Facebook is performing better than Exxon. However, note the difference in assets. Exxon has 4x the assets of Facebook. As previously noted Exxon is performing better than some of its industry competitors on an ROA basis. Accordingly, it is imperative to understand the comparison of ROA across industries is not always reasonable or feasible. Additionally, it is important to note that within an industry, some businesses may have fewer assets than normal if they use leased assets vs. owned assets. Leased assets do not appear on the balance sheet, thus the total assets of such a firm would be far less than one that owned the assets. In such a case, the ROA for the company leasing assets would be far better. The observer should compare not only the ROA of competitive businesses (or alternative investments) but the level of balance sheet assets employed by each. This will be another way of ensuring true comparative ROA calculations. Return on Assets assumes a constant asset level over time. However, in situations where intra-period fluctuations are likely or expected to occur, it is often a good idea to use average assets. The formula is similar to ROA but allows for average assets. While fixed assets comprise a majority of most balance sheet assets, some industries have greater amounts of current assets or current assets that fluctuate greatly. In these cases, the ROA calculation can be modified to only include long-term, fixed assets. This measure is of value when such assets are key to long-term performance. The ultimate value of ROA for measuring ROI is to evaluate it on a going concern basis over time, viewed from a trending perspective, and compared to industry standards and typical balance sheet construction for similar firms/investments. Return on Equity (ROE) is a measure of return on the equity investment made in a business of investment. Note that Total Equity consists the paid in capital plus the retained earnings (undistributed profits reinvested in the business). This is usually the part that draws an element of confusion, it should not represent the market value of the company’s traded stock. ROE differs from ROA because of leverage, which is the money borrowed for investment in the business. Essentially, if no funds were borrowed, and all of the invested capital was equity, the ROE and ROA would be exactly the same. Yet, if the cost of borrowed funds (i.e. Interest Rate) is lower than the unleveraged ROA, leveraging the assets will result in an ROE that is greater than the unleveraged ROA. While ROA is used as a comparison between operating businesses or to determine financial feasibility, ROE is most often used to determine the actual or projected return on investment dollars. Like ROA, the ROE trend over time is potentially more valuable than any single data point. What is the typical ROE for business ventures of the type being explored? What is the minimum ROE that the investor would find acceptable? While ROE describes the return on equity, Return on Invested Capital (ROIC) describes the overall return on all invested capital: equity and debt. ROIC measures the overall return on the equity and debt invested in the business. 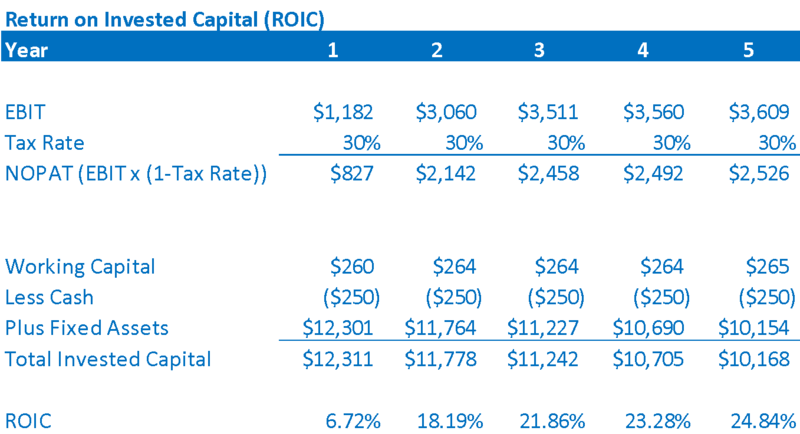 ROIC is used to compare the return on invested capital to the overall cost of the invested capital, most commonly the Weighted Average Cost of Capital (WACC). If ROIC > WACC, then the venture is providing a sufficient return that exceeds the hurdle of returns required by debt and equity investors, indicating that a project is performing (or is projected to perform) satisfactorily. Suppose the WACC for ABC, Inc. is 20%. In years 1 and 2, operating results are less than required, which is not unexpected for a start-up venture. However, in years 3 to 5 ROIC exceeds WACC, indicating that desired returns will be paid to investors. The excess return will be additional profit for equity investors, or additional retained earnings in the business. Unlike ROA and ROE, ROIC is business specific and related to the cost of capital for the particular venture. Over time, WACC can change, and therefore it is imperative that a current period WACC be compared to current period ROIC. ROA, ROE, and ROIC were going concern returns on investment based upon net income or accounting based returns or profits. Total Investment Returns on the other band are measures of cash-on-cash return, and are based upon amounts of cash invested, cash received, and the timing of cash flows. The two primary total investment return calculations are Net Present Value (NPV) and Internal Rate of Return (IRR). Both measures are rooted in Time Value of Money concepts, which essentially state that money has time value because it can earn interest when invested over time. Net Present Value (NPV) is equal to the sum of the Present Value (PV) of the invested cash (cash outflow) plus the PV of each cash inflow received in the future. These cash inflows represent the recovery of the investment plus the return (profit). The discount rate used to calculate the PV of each cash flow is the minimum return the investor finds acceptable, often known as the “hurdle rate”. To calculate NPV, the future cash flows must include all of the future cash flows to be received. However, most business ventures are expected to continue indefinitely into the future. To create a finite number of projected future cash flows, a proxy value for all cash flows occurring after then end the projection needs to be calculated. This value is called a Salvage Value or a Terminal Value. Salvage Value approximates the net sales proceeds received by the investor assuming the investment were sold in the final period of the projection. By assuming a sale of the investment, the total cash flows are finite and occur inside the term of the projection. For ABC corporation, the expectation is that the business will continue indefinitely. Therefore, the Terminal Value is equal to the Year 5 cash flow divided by the investor’s hurdle rate of 15%. Once the total cash flows by period are determined, the PV of each is calculated, and the sum of the PVs is the NPV. Once the NPV is calculated, the analysis is very simple. If NPV is greater than 0, the PV of the future cash inflows exceeds the PV of the investment (or cash outflow). In this case, the return exceeds the minimum requirement 15%. An NPV greater than 0 indicates that the actual return exceeds the discount rate. NPV does NOT provide a specific return on investment value (i.e. a percentage), but it is normally used as a preliminary measure of return to elicit a “go/no-go” decision about an investment. Essentially, the WACC rate is considered the minimum rate of return the project must achieve if the project is to be pursued. This rate is sometimes called the “hurdle” rate. If the project can “get over the hurdle”, then it will often be pursued. The projection for ABC indicates a positive NPV, and thus it clears the hurdle. As mentioned, NPV does not provide an actual return value. However, the overall return on investment represented by the cash inflows and outflows can be determined using the Internal Rate of Return (IRR). One definition of IRR states that IRR is the discount rate that makes the NPV exactly equal to 0. If, for example, the WACC comprised of the required return for debt and equity was, say 33%, and the NPV of a project was exactly 0, then the IRR would be 33%. Calculating IRR can be achieved by running multiple iterations of the NPV projection and changing the discount rate on each calculation until the NPV is 0. A more efficient method of calculation is to use the IRR function in spreadsheet software such as Excel, or with a financial calculator. Using Excel, the IRR for ABC is projected at 33%. The hurdle rate for this investment was 15%. NPV told us that the return exceeded the hurdle rate, and IRR told us that the exact return was 33%. Returning for a moment to the initial question, “What’s my return?”, IRR is probably the return value an investor is seeking when evaluating investment opportunities. Using IRR, the investor is informed that he/she will recover the investment proceeds plus a return of 33% on invested funds. Social Return on Investment (SROI) is an attempt to quantify the social benefit to be derived from an investment opportunity. Originating in the US, SROI quickly gained acceptance in Europe. A key assumption of SROI is that the social impact value of a project exceeds the initial investment amount, otherwise, the SROI would be a negative value. The greater the spread between the social impact value and the initial investment, the greater the SROI. While SROI expands the concept of return on investment analysis beyond the bounds of traditional finance, sociological changes in society are driving investors to look beyond the numbers to social value and benefit. Undoubtedly as SROI evolves it will become more prevalent in business venture evaluation. Which Return Calculation is Right for My Projection? Believe or not, each of these calculations should be prepared for all business projections. Why? Because every party reviewing the financial projections will do so from a different perspective. The ABC projection discussed was included in a business plan that was reviewed by both potential equity investors, as well as potential lenders of growth capital. The Equity investors’ first focus was on the Total Investment Returns, specifically IRR, which would show the projected return on their equity investment. Recall though that IRR assumes a residual, or terminal value as part of the final cash flow. In this case, the investors also understood that they needed to accept the validity of the terminal value assumptions, or else the IRR would be flawed. In the case of ABC, the terminal value assumed a constant cash flow for years beyond the scope of the projections. For ABC though, this was a conservative assumption, as its cash flows were likely to increase in the out years. Additionally, the Equity investors also reviewed the Going Concern Measures, specifically the ROE and ROIC measures. ABC (like most startups) had an ultimate exit strategy of going public. In order to be attractive to IPO investors, ABC was going to need to project a stable on-going return on investment befitting the buy-and-hold thesis of large public market money managers, such as pension funds. Potential lenders also focused on the Going Concern Measures, which are actually part of a group of measurement tools called Financial Ratios, which provide a variety of operational measurements that allow analysis of a specific company’s operations and a comparison with other firms in the industry. Potential lenders will often review these return metrics because they are looking for one key item: financial stability over time, at a level of operation more than sufficient to repay the indebtedness. The ROA and ROIC measures specifically illustrated how ABC was going to be profitable, but that operations were projected to be stable and grow at reasonable rates over time. Returns are measures not only of a venture’s performance, but also a measure of one firm to another. Typically this type of analysis is called benchmarking. Key to benchmarking is to identify companies as similar to the subject company as possible. For example, American Airlines benchmarks itself to United, Delta, and other major airlines. Evaluating return metrics for competitors allows for ranking as well as determining industry averages and standards. Obviously, projecting a new venture’s performance equal to or better than industry averages will be attractive to investors of all types. Return on investment measures are foundational for new projects as well as going concerns. These measures will undoubtedly be part of the financial landscape for many, many years to come. However, new ratios such as Social Return on Investment may become part of typical financial analysis. At this time, die-hard financial number crunchers will likely find such measures less meaningful as hard values can be difficult to assign to social impact value. Yet, there is no argument that the issues of societal benefit creation and/or lack of socio-environmental damage will be considered by potential investors either because of personal conviction or social pressure. ABC is in an industry that promotes social good by the very nature if its business, therefore specific ratios measuring the good were not needed. However, all ventures should begin to give consideration to these issues in some form as business moves deeper into the twenty-first century. Many new ventures are pursued by founders who are passionate about the business and its product or service. However, passion alone won’t attract investors. In the long run, it comes down to money and making money. Turning passion into measurable returns is how one finds the financial investment to realize the dream. ROI measures the financial return on an investment relative to its cost. The calculation consists of the return divided by the expenditure The result is expressed as a percentage or a ratio. What do NPV and IRR tell you? NPV shows the value at the current day of inflow and outflow cash flows of a project, relative to the weighted average cost of capital. For values above zero, it demonstrates that the project is value accretive. IRR shows the maximum WACC required for a project to be profitable. What is the social return on investment? SROI assess the social benefits of a project relative to the initial investments. It categorizes these benefits into four areas: inputs, outputs, outcomes, and impacts. Thanks for the article. This is with very helpful short summary of ROI calculation. Some of the industries may have seasonality .Total assets of the company can have dramatically changed in FY and ROA calculations may not show the correct ratios. For example in car industry , companies which are distributers, buy new model cars at the beginning of the year that resulted with increase in stocks. Thus, we should always demonstrate quarterly ratios of the company while preparing our reports if there is seasonality . Home › Blog › What’s My Return on Investment and How Do I Calculate It?